Random Writings: A good Ad? Well there is one that stands out, for it's uniqueness, dynamism, ability to generate wide spread interest, with gallons of creativiey and an 'oomph so powerful that it can be felt in the dark valleys of..well Liverpool St. station..yes you got it, it is the T-Mobile – Life's for Sharing campaign. The T-Mobile campaign stands out more so than any other due to its ability to be fresh and dynamic and capture the imagination of not only their target market but a larger audience, while maintaining the core elements of a successful campaign. 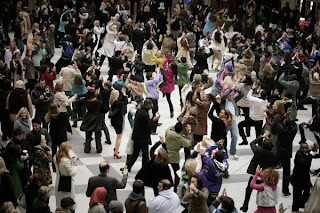 The 'Liverpool Street Station dance' showed how advertising and marketing can still push the boundaries in being creatively dynamic and generating interest on a huge scale due to its fresh and unique approach. However, for me the most important factor of this campaign is how it infused that creativity and dynamism into a successful and connecting marketing 'idea' for T-Mobile. The campaign held the core values of sharing, enjoyment, people and emotion, together with this fresh, dynamic, inspiring idea to produce a campaign which connected to T-Mobile very successfully. Credit should also be giving to the creative edge of the campaign, as over night it became more than an 'advert', it transformed into an internet phenomena, and the talk on everyone's lips. I believe this was a very successful campaign due to its ability in every way to be fresh, connecting and interactive, while constantly relating to the brand in question. Looking back at it, each element of the campaign worked immensely well with everything involved, from the wide spread interest generated, to the fusion of values and ideas, to the idea of sharing, down to the simplicity of the overall idea itself. A campaign very precisely put together, and perfectly executed. Is Microsoft really to blame? Why is Adland such a 'blah'?